Mercury is a poison that acts on the nervous system and is of significant ecological and public health concern. 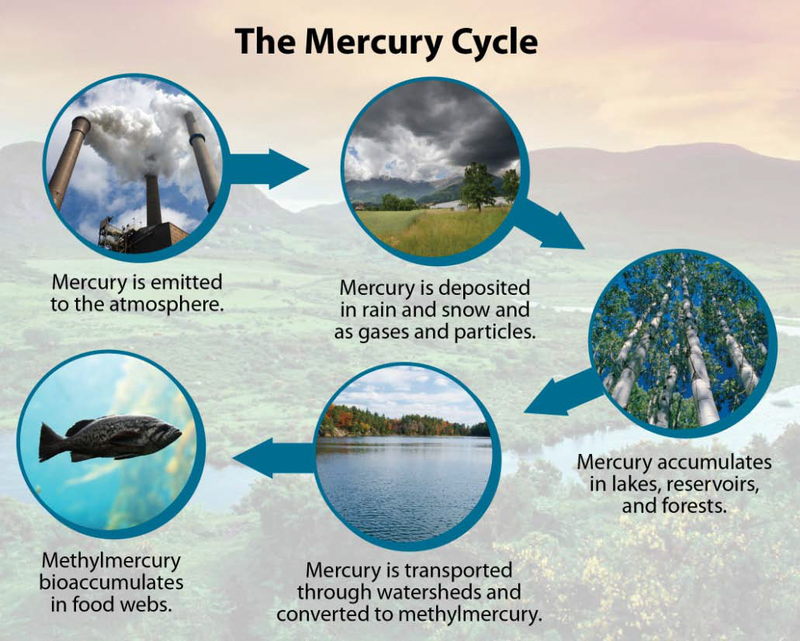 Of all forms, methyl mercury (MeHg) is by far the most potent and harmful to humans and ecosystems, exacerbated by its biomagnification through the food web. To protect human health, the United States Environmental Protection Agency (EPA) set a fish tissue criterion for MeHg at 0.3 micrograms per gram (µg g-1) under section 304(a) of the Clean Water Act. Similar criteria for wildlife are under development or promulgation in several states (Driscoll et.al., 2007), with all states having some type of mercury fish advisory, and nine states in Region 8 having statewide fish advisories (https://fishadvisoryonline.epa.gov/Advisories.aspx?tabId=0). At present atmospheric deposition is the dominant mechanism for the presence of mercury in the biosphere and combustion of coal, most prominently from generators of electricity, is the dominant source (Sams, 2007). It is emitted in three species, as summarized in Table 1. Divalent or ionic forms of mercury (HgII) are highly reactive, and are most readily converted to MeHg. The methylation process takes place within aquatic sediments with low or no oxygen present, and through the action of sulfur reducing bacteria. It has been established that higher levels of sulfur, as from acidic deposition entering aquatic systems, will result in higher levels of MeHg production in those systems. It has been hypothesized that the increased temperatures anticipated with climate change may speed the methylation process. Mercury emissions across the United States are expected to decline due to recent EPA regulatory actions, and may have already declined due to fuel switching from coal to natural gas as a result of low prices. This in turn may eventually lead to reductions in MeHg levels of some freshwater fish and other wildlife. However, much of Earth′s atmospheric mercury load is carried across the globe in the stratosphere (upper atmosphere), with concentrations increasing due to the rapid expansion of uncontrolled coal combustion in Asia. aHg0 symbolizes elemental mercury; Hgll symbolizes divalent, oxidized mercury; HgP symbolizes particulate mercury. bIncludes residential boilers, sewage sludge incinerators, woodfired facilities, lime manufacturing, mercury compounds production, cement manufacturing and secondary mercury production. However, a number of potentially important source categories (such as refineries) are not included because emissions estimates for these sources are currently lacking. cFrom Friedli et al. 2003.
dBecause most area sources do not involve combustion, their emissions are assumed to be 100% Hg0 for this source category. However, a small (but presently unknown) fraction of area source emissions may be in divalent or particulate forms. Mercury concentrations are high enough in wildlife that consumes fish to cause adverse behavioral, physiological, and reproductive effects, including: subtle visual, cognitive, and neurobehavioral deficits in small mammals and birds. In addition, controlled experiments with mink (Mustela vison) and otter (Lutra canadensis) have established that dietary MeHg concentrations of 1 µg g-1 lead to death in less than a year. (Driscoll et al., 2007; Wiener et al. 2002). Likely relevant for the southern United States., fish eating species in the northeast were repeatedly shown to have some of the highest MeHg levels of 38 species analyzed (Evers et al. 2005). Insectivorous birds in both aquatic and terrestrial habitats (such as montane areas) were also found with elevated MeHg levels. Based on monitored MeHg levels in the belted kingfisher (Ceryle alcyon) and bald eagle (Haliaeetus leucocephalus), MeHg availability increased from marine, to estuarine and riverine systems, and was greatest in lake habitats. Future global temperatures are expected to increase mobilization of legacy reservoirs of mercury in the boreal forest and tundra permafrost and to increase methylation rates (Callister et al., 1986). In addition, increases in elemental mercury atmospheric residence time due to these rising temperatures will lead to wider global distribution by as much as 66 percent due to background bromide and rising ground-level ozone interactions (Parrella, 2012). Much of Earth′s atmospheric mercury load is carried across the globe in the upper atmosphere, with concentrations increasing due to the rapid expansion of uncontrolled coal combustion in Asia. Severe rainstorms may tap into this upper atmosphere reservoir, bringing these increased mercury concentrations to the lower atmosphere, and ultimately to Earth′s surface. This has been hypothesized as a factor in the recent extremely high concentrations of mercury in rain water monitored in Puerto Rico (Shanley, 2013). Monitor mercury levels in water and wildlife, as linked to implementation, effectiveness, and validation monitoring associated with various forest land management activities (e.g., management of sedimentation associated with timber harvest). Rank wetlands and lakes as to their potential for elevated MeHg production rates. Minimize water level manipulations of lakes and wetlands to minimize mercury methylation rates within aquatic sediments. Minimize sedimentation associated with land disturbance activities. Manage fish species relative to risk factors associated with proximity of mining operations, lake morphology, and landscape ecology (e.g., avoid managing for top predators in areas of high risk). Comment to state and federal air regulatory officials to maximize controls on industrial mercury and sulfur dioxide emission rates near sensitive ecosystems. Callister, SM; & Winfrey, HR 1985. Microbial methylation of mercury in upper Wisconsin River sediments. Water, Air and Soil Pollution. 29:453-465. Driscoll, CT; Han, Young-Ji; Chen, CY; Evers, DC. Lambert, KF; Holsen, TM; Kamman, NC; and Munson, RK 2007. Mercury Contamination in Forest and Freshwater Ecosystems in the Northeastern United States. Bioscience 57:17-28. Evers, DC; Burgess, NM; Champoux, L; Hoskins, B; Major, A; Goodale, WM; Taylor, RJ; Poppenga, R; and Daigle, T 2005. Patterns and Interpretation of Mercury Exposure in Freshwater Avian Communities in Northeastern North America. Ecotoxicology. 14:193–221. Friedli, HR; Radke, LF; Lu, JY; Banic, CM; Leaitch, WR; and MacPherson, JI. 2003. Mercury emissions from burning of biomass from temperate North American forests: laboratory and airborne measurements. Atmospheric Environment. 37:253-267. Parrella, JP; et al. 2012. Tropospheric bromine chemistry: implications for present and pre-industrial ozone and mercury. Atmos. Chem. Phys. 12:6723-6740. Sams, CE 2007. Methylmercury Contamination: Impacts on Aquatic Systems and Terrestrial Species, and Insights for Abatement. Advancing the Fundamental Sciences. PNW GTR-689. 2:438-448. Shanley, J 2013. U.S. Fish and Wildlife Agency, Personal Communication. Wiener, JG; ;Drabbenhoft, KP; Heinz, GH; and Scheuhammer, AM 2002. Ecotoxicology of mercury. In: DJ Hoffmann, BA Rattner, GA Burnton Jr., and J Cairns Jr., eds., Handbook of ecotoxicology. Boca Raton, FL: CRC Press: 61 p. Chapter 16:409-464. Sams, C. 2007. Methylmercury Contamination: Impacts on Aquatic Systems and Terrestrial Species, and Insights for Abatement. Advancing the Fundamental Sciences, PNW-GTR-689. 2:438-448.